Heat pumps extract heat from the surrounding air (Air Source Heat Pump shown below) or the ground (Ground Source Heat Pump shown on the left). An Air Source Heat Pump (ASHP) takes its heat from the air and so its efficiency depends on air temperature, the advantage is they are easy to install. A Ground Source Heat Pump (GSHP) extracts heat from the ground which has more stable temperature throughout the year and is therefore more efficient. The heat pump requires a collector which can either be a vertical bore hole of several hundred metres, or a horizontal loop buried 1-2m below ground. A GSHP is more complicated to install than an ASHP. A third type of heat pump extracts heat from water (either lakes or rivers). The heat pump advantage is that for every kW of electricity it consumes it can produce up to 4kW of heat. 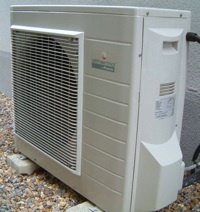 Heat pumps are generally better suited to new buildings but can be retrofitted in some circumstances. If you have a reasonable demand for hot water for heating or other uses then heat pumps can provide a cost effective solution.